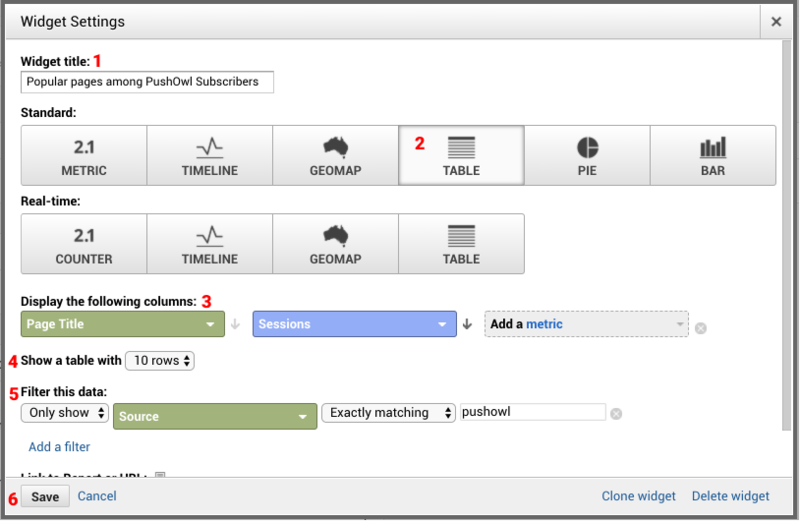 Setting up an Google Analytics dashboard to track the performance of your push campaigns is simple. PushOwl already adds the following UTM parameters to your notifications to make your job a bit easier. 1. Select 'Customization' and click on 'Dashboards' from the dropdown. 2. 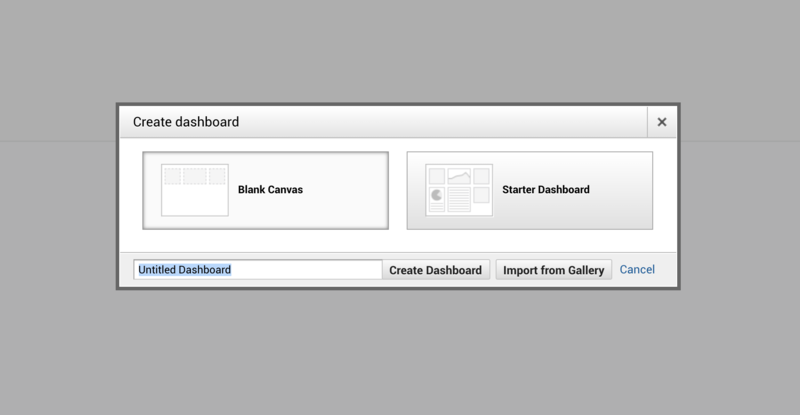 Click on 'Create Dashboard' on the page. 6. Your dashboard is ready to be customised. 1. Name the widget 'Sessions'. 3. Click on ‘Sessions’ (3) from the 'Show the following metric' dropdown'. i) Click on 'Only show'‘ from the first dropdown. ii) Search for 'Source' in the second dropdown and select it. 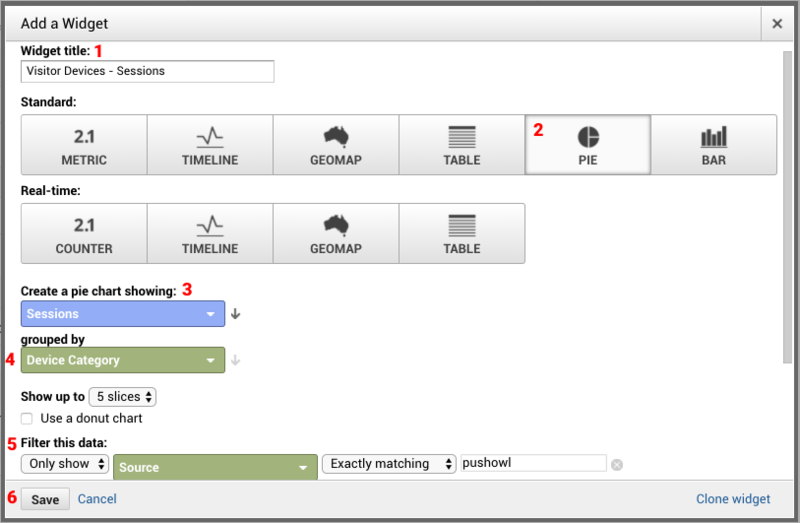 iii) Click on 'Exactly matching' from the third dropdown. iv) Enter the keyword 'pushowl' in the blank field. 1. Name the widget 'Average Session Duration'. 3. Click on ‘Avg. Session Duration’ (3) from the 'Show the following metric' dropdown'. 1. Name the widget 'Revenue'. 3. 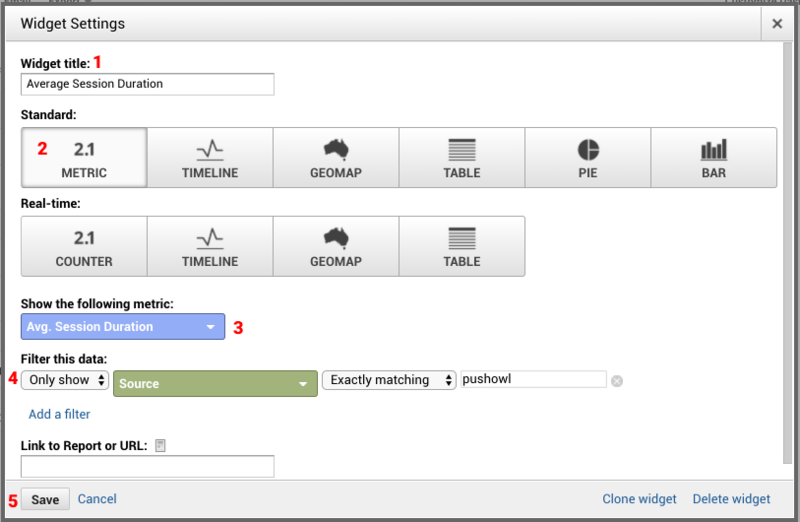 Click on ‘Revenue’ (3) from the 'Show the following metric' dropdown'. Note: You’ll see that Google Analytics and PushOwl don’t have the same amount attributed under revenue. This is due to the concept of different attribution models. 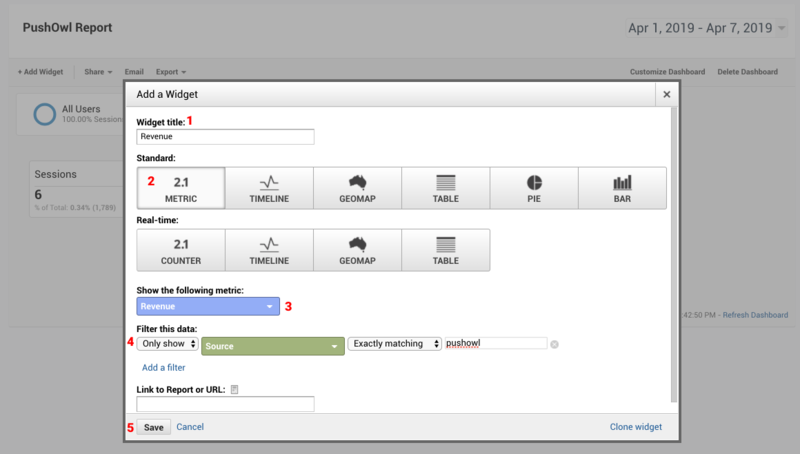 You can read up about how Google Analytics attributes revenue here. 1. 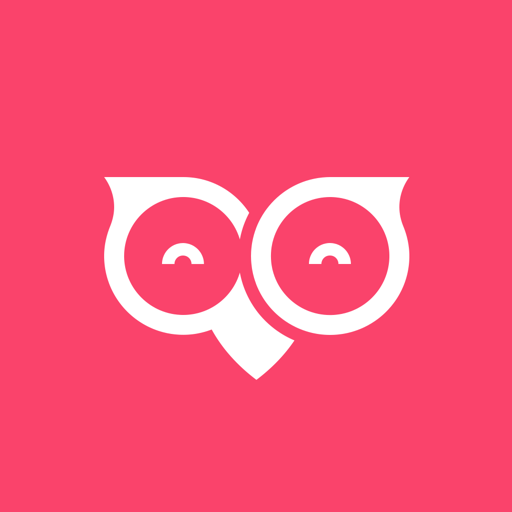 Name the widget 'Popular pages among PushOwl Subscribers'. 2. Click on ‘Table’ from Standard options. i) Click on 'Page Title' from the first dropdown. ii) Click on 'Sessions' in the second dropdown. 4. Click on '10 rows' from the dropdown next to 'Show a table with'. 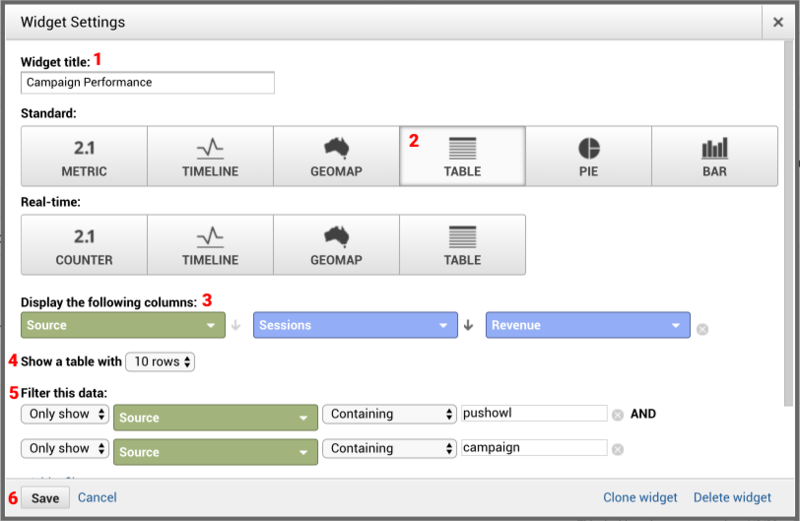 You can track how your campaign is performing, the sessions it brought in and the revenue earned. 1. Name the widget 'Campaign Performance'. i) Click on 'Source' from the first dropdown. iii) Click on 'Revenue' in the third dropdown. If you use the Abandoned Cart Reminders feature, you can also track its performance. You can use Analytics to see the revenue earned through the feature and the number of sessions the feature has brought to your store. 1. Name the widget 'Abandoned Cart Recovery Performance'. v) Click on 'Add a Filter' and repeat steps i) to iii). vi) For the blank field, enter the keyword 'abandoned_cart'. If you use the Back in Stock Alert feature, you can also track its performance. You can use Analytics to see the revenue earned through the feature and the number of sessions the feature has brought to your store. 1. Name the widget 'Back in Stock Alert Performance'. vi) For the blank field, enter the keyword 'back_in_stock'. If you use the Price Drop Alert feature, you can also track its performance. You can use Analytics to see the revenue earned through the feature and the number of sessions the feature has brought to your store. 1. Name the widget 'Price Drop Alert Performance'. i) Click on 'Only show' from the first dropdown. vi) For the blank field, enter the keyword 'price_drop'. 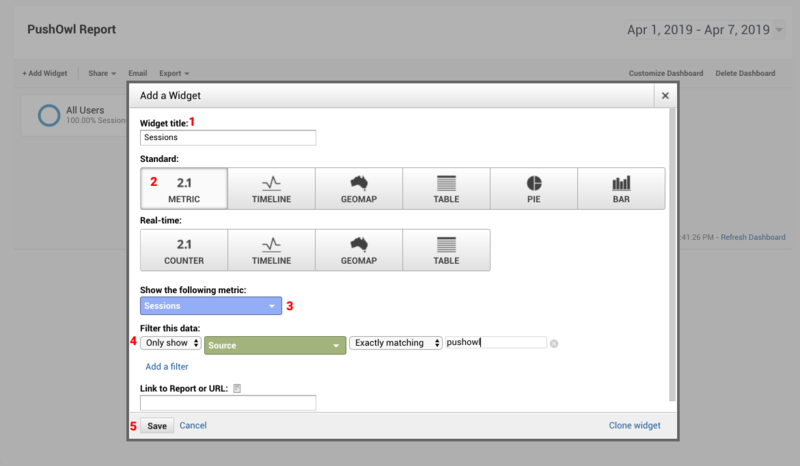 You can also see which device your visitors are using by creating a pie widget on your Analytics Dashboard. 1. Name the widget 'Visitor Devices - Sessions'. 2. Click on ‘Pie’ from Standard options. i) Click on 'Sessions' from the dropdown. i) Click on 'Device Category' from the dropdown. 1. Name the widget 'Visitor Devices - Revenue'. i) Click on 'Revenue' from the dropdown. 1. Name the widget 'Location'. 2. 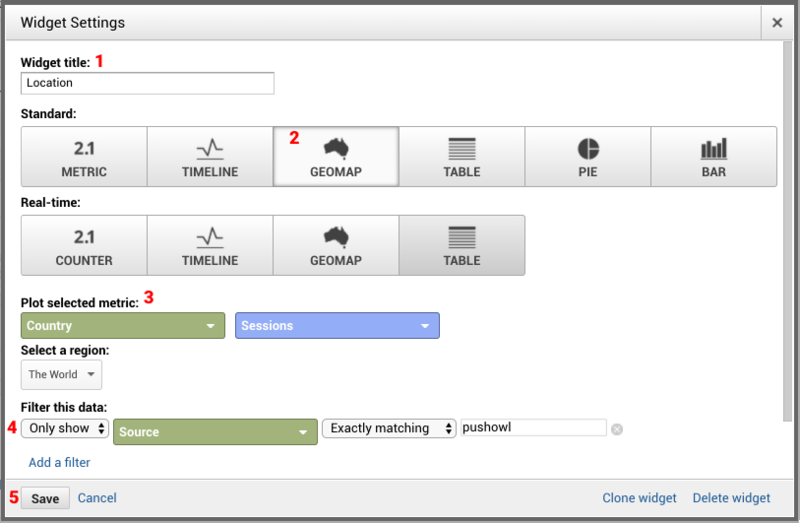 Click on ‘Geomap’ from Standard options. i) Click on 'Country' from the first dropdown. ii) Click on 'Sessions' from the second dropdown.